The Volvo C70 coupé convertible is a great option if you're in the market for a stylish and well-built car that'll provide excellent levels of refinement, along with a comfortable and engaging ride. 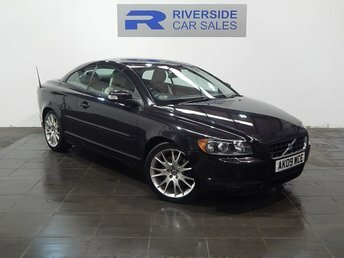 You'll find the complete range of used Volvo C70 for sale in Burton upon Trent listed here on the website, all of which can be taken for a test drive once you've spoken to a member of our friendly and knowledgeable showroom team. For more information, get in contact today to discuss your individual requirements. Finance is available to UK residents aged 18 years or older, subject to status. Terms & Conditions apply. Indemnities may be required. Other finance offers may be available but cannot be used in conjunction with this offer. We work with a number of carefully selected credit providers who may be able to offer you finance for your purchase, commission may be received. We are only able to offer finance products from these providers. Postal Address: Riverside Car Sales Ltd, Derby Road, Burton On Trent, Staffordshire DE14 1RN. Find contact details here.